As co-chair of the Labor and Employment Group at Bernstein Shur, Andrea Johnstone regularly counsels New Hampshire businesses on how to stay on the right side of employment and labor law. Her expertise has not gone unnoticed. The wife and mother of two teenage boys has been recognized since 1995 in Best Lawyers in America and by Chambers USA for her work in employment and labor law. Throughout her career, Johnstone also has demonstrated a deep commitment to community, serving on the boards of several nonprofits, where she has developed relationships she calls "invaluable" to her private and professional lives. 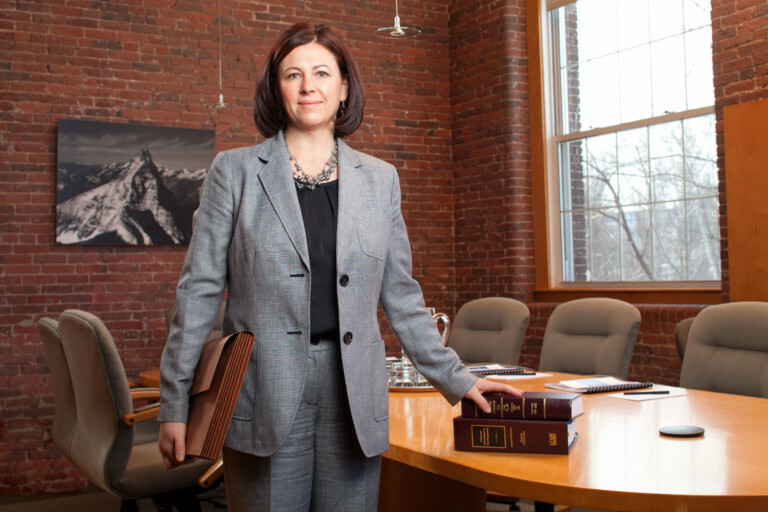 After launching her career as a New Hampshire Superior Court law clerk, Johnstone joined the Concord firm of Gallagher, Callahan & Gartrell, where she became a shareholder within a few years and chaired its Labor and Employment Law Practice Group for nearly a decade. In 2006, the Hopkinton resident moved her practice to Bernstein Shur's Manchester office, where she is currently a shareholder and has helped to triple the number of office staff and recruit key corporate clients. "Not only is she an outstanding lawyer, she is an exceptional person," wrote former New Hampshire Chief Justice John T. Broderick in endorsing Johnstone's nomination. "Her opinion is respected by corporate management throughout New Hampshire and beyond." A. I wish that I could tell you it was an intentional choice, but like so many things, it was luck. I was very fortunate to interview for the position at Gallagher, Callahan & Gartrell. When they made me the offer, they asked if I was willing to be an associate in the Labor and Employment Practice Group, where they had an opening. They assured me I would work closely with attorneys in the litigation department, so I had a hybridized practice. A. I had a number of individuals I went to to brainstorm. Learning that it was important to build up that network of trusted friends, advisers and resources, who provided a sounding board for the things that come across your way – that was key. A. I've been fortunate that my kids have a caregiver who has been in both of their lives since they were born who, as far as we are concerned, is a member of our family. I also have an extremely devoted husband to my kids. We really operate as a team. We do not have a household in which grownups do X, Y and Z and the kids are along for the ride. A. One of the challenges has been managing how quickly technology has changed and the inundation of information that we all receive through e-mail and increased professional demand. That 24/7 work life that is out there, and trying to continue to live up to the professional expectations but at the same time setting boundaries that allow you to be healthy and be responsive to the other parts of one's life — that is the challenge. A. Develop that support network of mentors and professional friends, and to recognize that there isn't a right way to achieve their professional goals. Recognize that each individual's path to success isn't necessarily the same.